Christ the Healer. Acrylic and gold leaf on birch panel. 18x24"
Installation in Prayer Chapel at IU Health Goshen Hospital, Goshen, Indiana. "O almighty master, physician of souls and bodies who humbles and raised up, who chastises and again heals, do thou forbid the spirit of sickness, heal every wound, ever infirmity, every sore, ever fever, ever pain, and seizure. Yea, O Lord be merciful unto thy creation, in the name of Jesus Christ our Lord. Amen." The Antiochian, Russian, and Ukrainian Orthodox churches of Goshen, Indiana, commissioned this icon of Christ the Healer for the local hospital's prayer chapel. 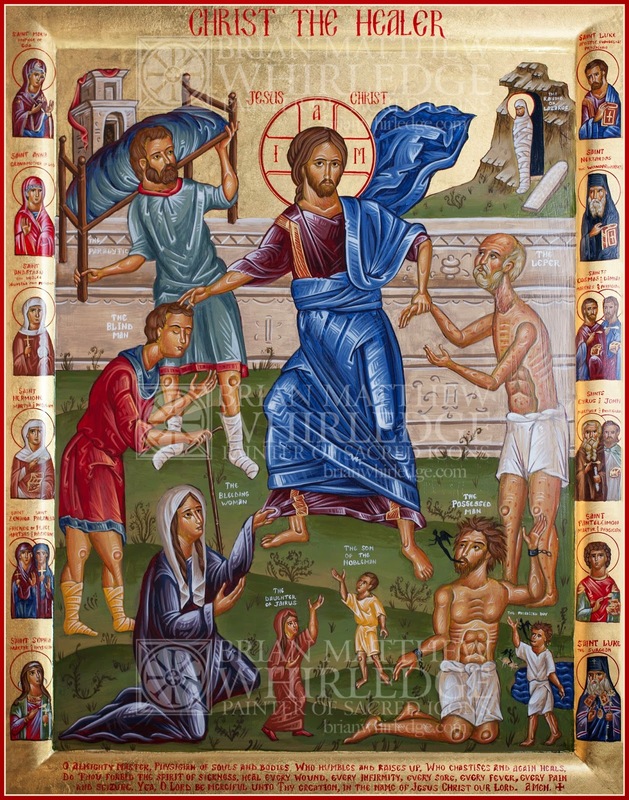 Christ is surrounded by those he has healed: The Paralytic, Lazarus, The Leper, The Possessed Boy, The Possessed Man, The Daughter of Jairus, The Bleeding Woman, and The Blind Man. Along the borders are small icons of 15 saints associated with healing: The Theotokos, Saint Anna the Grandmother of Christ, Saint Anastasia Deliverer from Potions, Saints Hermione, Philonella, and Zenaida, Saint Sophia Martyr and Physician, Saint Luke the Apostle and Evangelist, Saint Nektarios of Aegina, Saints Comas and Damian, Saints Cyrus and John, Saint Panteleimon, and Saint Luke the Surgeon of Simferopol. Photo of Icon by Codey Holliday. Hi! is there any way this icon (or one similar to it) may be purchased? Damascene Gallery www.damascenegallery.com handles all my prints/reproductions. My work isn't on their website yet, but if you inquire via email, they can print/mount it for you.